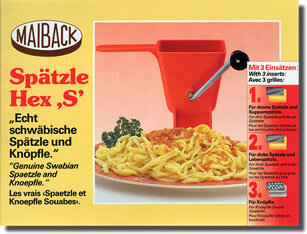 The Spätzle Hex 'S' (Spaetzle Wizard) is imported from Germany for sale in North America. 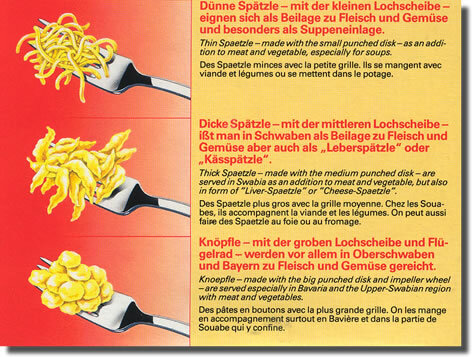 It is by far, the easiest way to make fresh original Schwäbische spaetzle in your own kitchen. The batter is simple to make (see the recipe) and it's even easier to cook with the Spätzle Hex. The Spätzle Hex conveniently rests on the side of a boiling pot of water. The batter is effortlessly pushed through the holes in the bottom of the hopper, with the aid of the unique ribbed roller, and falls into the pot of boiling water. Once the spaetzle floats up to the surface it's cooked! Simply spoon out with a slotted spoon into a serving dish to garnish as desired and serve. we have temporarily suspended shipping. The Spätzle Hex 'S' is designed to simply rest on the edge of a pot of boiling water. The batter is spooned into the top, which is shaped like a "hopper", and the crank is turned to press the dough through the holes in the bottom and into the boiling water. When the spaetzle floats to the top it's cooked and ready to be spooned out with a large slotted spoon. It is fun to make and delicious to eat. Caution: Making spaetzle with the Spätzle Hex involves using a pot of boiling water. This is NOT a safe activity for children, hence caution and care is strongly recommended if children are present. 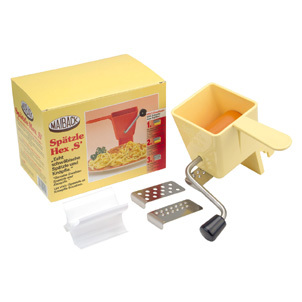 The Spätzle Hex 'S' comes with three inserts, and two types of rollers. For thin spaetzle - use the small-hole punch plate with the standard ribbed roller. For thicker spaetzle - use the medium-hole punch plate with the standard ribbed roller. For round spaetzle - use the large-hole punch plate with the impeller roller. This will make a teardrop-shaped spaetzle, better known as knöpfle.